Tractor trailer fire in Westport, Conn., on Feb. 9, 2019. WESTPORT — Smoke billowed across Interstate 95 during a tractor trailer fire on Saturday that caused lane closures and a backup of traffic for nearly three hours. The incident was reported around 6:20 p.m. on I-95 north between Exit 18 and Exit 19. The tractor trailer was pulled over on the right-hand shoulder, with the front end engulfed in flames. Officials said Westport and Fairfield fire departments sent units to handle the fire, which fully engulfed the cab of the tractor trailer, with fire exposing the trailer. The two occupants of the truck were out of the vehicle before firefighters arrived on scene, officials said. Fairfield fire units helped with water supply and stretched an additional hand line to help extinguish the flames that were intensified by ruptured diesel tanks, officials said. The contents of the trailer were not damaged by the fire. Within less than 20 minutes of the fire catching, there were heavy delays leading up to the area in both directions. Connecticut Department of Transportation reported northbound traffic was backed up between Exit 17 and Exit 19. Southbound traffic was no better, with drivers hitting their brakes to check out the blaze. As fire crews worked to get the blaze out, all three lanes of travel had to be temporarily shut down. 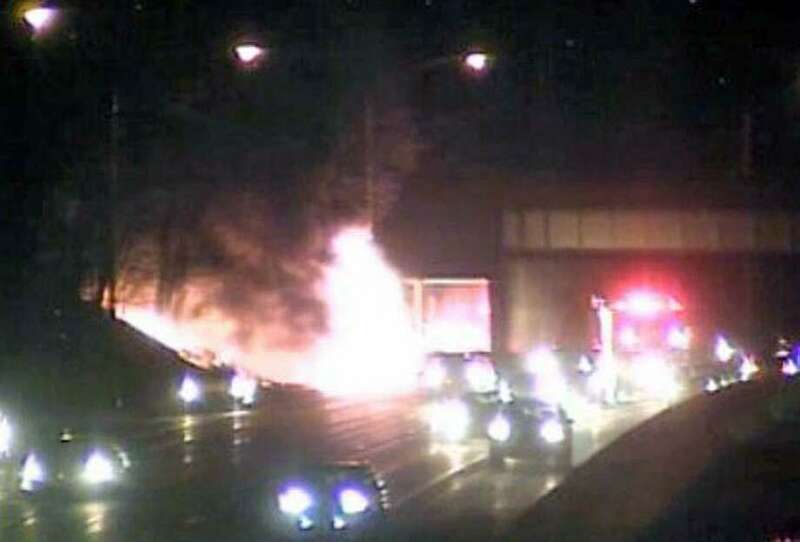 By 7:10 p.m., the bulk of the fire appeared to be out, according to the CTDOT traffic camera in the area. The right and center lanes were closed and remained that way until around 8:20 p.m.
Around 9:15 p.m., southbound traffic had returned to its normal speed flow, but northbound traffic continued to see slowdowns approaching the area. The tractor trailer was towed from the scene. Within five minutes, the Connecticut State Police reported they were waiting for CTDOT sander trucks to ensure the water used to extinguish the tractor trailer fire didn’t cause any icy road conditions. By 9:35 p.m., the site of the incident had been cleared and all traffic was flowing through the area as normal. There was no immediate word on any possible injuries. The state Department of Energy and Environmental Protection also responded to help with the cleanup of unburned fuel. State troopers handled the traffic and investigation. The last fire unit cleared shortly after 10 p.m.